What to say that hasn't already been said - this film is also just a lot of fun. Taking away nothing from this film - I suspect that its impact on audiences of the day wasn't nearly as powerful as it is now (an aspect of film history which I find fascinating - how some films just keep getting better with time). @Klaus: Thanks for the comment! You make an excellent point: I think this film does mean more to later audiences than it did at the time it was released (and despite it's Best Picture win). It's definitely a movie where the magic gets better with age. 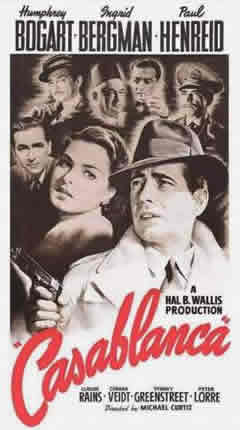 Look out for my Casablanca review soon! Moviesandsongs365: Absolutely! There are very few lines in the film that aren't classic (and my favorite is the "Waters of Casablanca" one you mentioned). I find it fascinating that Bogart and Bergman once spent a lunch break complaining about how trite and ridiculous the film's dialogue was. It's really what made the movie. as always, I look forward to reading your take on the film. Please be sure to stop back and let us know when it's posted! Yeah, it seems amazing now, doesn't it? It's the dialogue that makes the movie. I'll check out your review. Thanks! Great review of my all time favorite movie. #1 of your 2500 for me!